Mother’s Day is fast approaching and though traditional presents such as flowers and chocolates are great, there is a time to take things up a level. If your mum wears glasses or contact lenses on a regular basis, she probably longs for perfect vision. No more sitting on or losing glasses, or having to wash her hands to insert her contact lenses. These are things she would love to see the back of. Let’s face it, most people would like to enjoy 20/20 vision without the need for glasses or contact lenses. “I have been very, very happy with the whole experience with AVC. I admit I was very nervous about having Lens Replacement but am now over the moon – it is one month since my operation. And now, possibly for the first time in many years, you can give your mum the chance of clear vision without glasses or contacts. And that’s not all. You can also help your mum get a discount on the cost of her new vision surgery and earn a thank you fee with our referral programme. The program is open for all laser and non-laser treatments. Our programme is not a one-time only offer. The more people you refer (your Mum’s friends?) 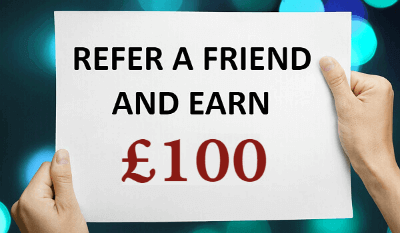 the more £100 cheques you will receive. What if Mum is Stubborn or is Afraid of Eye Surgery? It is not unheard of for our mothers to be against laser eye surgery or other forms of eye surgery for that matter. Advanced Vision Care sees 100% of patients achieve driving standard eyesight. 99% achieve 20/20 vision. “The level of care was second to none. The explanation of all suitability tests was great and very appreciated. Being able to meet Mr Pillai before the procedure was of huge benefit and re-assurance.Throughout the procedure the re-assurance and support was fantastic by Pawel, Mr Pillai and the Nurse. When I phone AVC I am greeted by someone who knows me and this is also of great benefit”. So, why not learn more about the referral programme by giving us a call on 0800 652 4878. We’re more than happy to give your mum the chance of perfect vision without her glasses or contact lenses.